30 April 2010, at 8:30a.m. BELGIUM - Many broiler producers are missing out by focusing on bird performance – rather than the actual cost of producing meat, Pelayo Casanovas, Cobb Europe sales and technical director, told a two-day customer seminar in Brussels. The obvious way to increase profitability is by reducing the cost per kg of liveweight meat produced, said Mr Casanovas. "Many companies only measure production efficiency with indicators like the European Production Efficiency Factor (EPEF) that takes into account feed conversion, mortality and daily gain. "Yet a drive to maximise broiler physical performance is not always the most effective business strategy. Remember that EPEF does not consider the cost of the feed used – and that is a very significant factor nowadays." He spelled out the four indicators that he regarded as the key to enhancing efficiency and profitability of broiler production – livability, feed cost per kg live broiler, uniformity and processing yield. He showed an example comparing breeds at a commercial operation where despite a lower EPEF the most successful achieved an additional €1.910 million gross margin per year on production of one million broilers per week. Almost 60 customers from Italy, France, Netherlands, Belgium, UK and Ireland attended the Cobb Western European technical seminar. The guest speaker was Monty Henderson, the recently retired president of George's Foods, a major integrated chicken producer in Arkansas, USA who reinforced the message from Pelayo Casanovas. 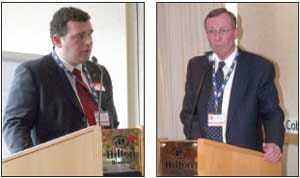 Matthew Wilson, Cobb broiler specialist (left), and Monty Henderson addressing the seminar delegates. "With the feed conversion advantage that the Cobb broiler has using lower density, lower cost diets and with grain prices seemingly more and more tied to world oil prices, the Cobb breeder seems well positioned as the world leader in producing the lowest-cost broiler," he said. "I am very impressed with the knowledge, commitment and organisation of the Cobb Europe sales and technical support team." He also spoke about the growth of the US chicken industry from the 1960s to a peak in 2007 before the economic crisis. He forecast that with a flattening in per-capita chicken consumption and pressure on margins, exports would be a key factor for the US industry but these were unpredictable owing to political and economic uncertainty. Euan Meldrum, marketing manager of Cobb Europe, who chaired the seminar, said the format with an opening session for all and then roundtable workshops on breeders and broilers had proved popular and would be repeated at future events.